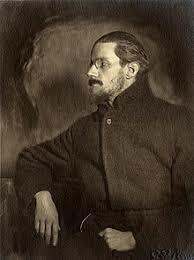 This poem was written by James Joyce in 1914 [1915?] in Trieste, shortly before the start of WWI (or a year into that conflict?). Since Joyce was a personal friend of MacLeish, the latter surely knew of this poem, and the twelve years till 1926 gave plenty of time for reading it. In fact, MacLeish did see the poem at least one time, in March 1927, when MacLeish responded very favorably to the poems in the booklet prepared to contain them (Pomes Penyeach), so Joyce went ahead with publication. They were first published 6 (or 7) July 1927 by Silvia Beach's Shakespeare and Company. Plus, the poem's title allows for reading the title as reference to the epic flood in the Bible, which might explain the use of the title in apocalyptic senses.